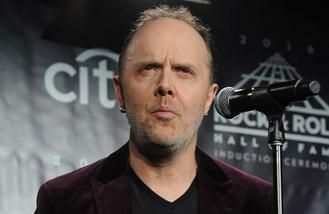 Lars Ulrich has been "less and less" inspired by other bands in the last three decades. The Metallica drummer hasn't been a fan of many fellow rock bands since the likes of Nirvana, Guns N' Roses and Oasis, with only a hand few of bands having an "impact" on him. The 53-year-old rocker is hoping to be "slapped in the face" and blown away by new emerging talent, although he is doubtful as it hasn't been happening for a long time. In an interview with Noisey, he admitted: "10 years ago or 30 years ago, it was different. "You were hearing about it, and you wanted to meet them. "Nowadays, there aren't any bands that have had that impact on me. "The last time where I was like, 'Holy f***! This really inspires me', was this band called Sword from Austin, Texas. "Stoner rock, kind of a modern Black Sabbath. "Super cool. They showed up seven or eight years ago, and I just had to bring these guys on tour. There is Norwegian band called Kvelertak These bands are few and far between nowadays. "This is not a black and white statement. I know more about film than I do about music because I follow it more. "That doesn't mean if something awesome came and slapped me in the face then I wouldn't embrace it, it just shows up less and less." Metallica - also comprised of James Hetfield, Kirk Hammett and Robert Trujillo - are gearing up for their extensive world tour in support of their album 'Hardwired... To Self Destruct', which kicks off on January 20 in Hong Kong, China. Lars has revealed the band have a "two-week rule" where they go home to seen their children every two weeks throughout the tour to keep them "sane". The 'Nothing Else Matters' hitmaker - who has Bryce, nine, Layne, 15, and Myles, 18, from previous relationships - explained: "We have a two-week rule: we don't leave home for more two weeks at a time, 16 days at the most. "We did 180 dates on the last album in two week increments. "It's not the most cost effective way of touring the world, but we believe you can't put any price on sanity. "If you remain somewhat sane, then there's a better chance of finishing all the shows and not jumping off the deep end in despair and misery." Students are clamouring to join a new university course studying the politics of Kanye West. Kaiser Chiefs, Texas, The Shires and more have been added to the line-up for the Isle of Wight Festival. Robbie Williams is to perform at the 2017 BRIT Awards. Sir Paul McCartney is suing Sony over the ownership of several Beatles songs. Paul McCartney is suing label executives at Sony/ATV to regain the rights to The Beatles song catalogue. Beyonce hopes to inspire "positive change" in the world through her official partnership with the Women's March on Washington. Ozzy Osbourne feared being a “loser” after Black Sabbath dropped him. Michael Buble has reportedly stepped down as host of the Brit Awards 2017 after his three year-old son was diagnosed with cancer. Liberty X are to reform as a girl group.